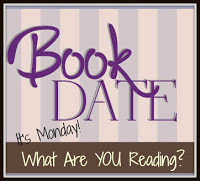 Book By Book: It's Monday 9/3! What Are You Reading? Hurray, it's September! We made it! This was not a good summer for us, with one family crisis after another, plus weather so hot & humid I barely left the house. It's still 90's today and so humid our windows are covered with condensation, but the turning of the calendar page tells me the heat will pass soon. Fall is my favorite season, and I can't wait for it to cool down a bit so I can get back to my normal walking routine. My husband and I have enjoyed a quiet Labor Day weekend with perfect balance: some downtime, dinner with friends, some productivity (we actually cleaned out our kitchen junk drawer! ), and my FIL came over for dinner. And of course, lots of reading! I finished my Big Book Summer reading and have turned my attention to dark and creepy books for the annual R.I.P. Challenge (I still need to sign up for 2018). And my husband is next to me reading right now. I finished my 5th and final Big Book of the year, just in time for the end of summer: City of Savages by Lee Kelly, a YA post-apocalyptic (and somewhat dystopian) novel that's been on my shelf for far too long! It's the story of two teen girls and their mother, trapped in a Manhattan that has been destroyed by war, and the ragtag society that has been established among the survivors. It must have been compelling because I stayed up way too late reading every night! Now, I am reading my first dark and creepy book of the season (though that last one would have counted, too) - Sleepwalker by Chris Bohjalian. I am a big fan of Bohjalian's novels, and this one has been on my shelf since Christmas, so I am glad to get it. It's a suspenseful story of a woman who sleepwalks and just disappears one night. Her husband and daughters (and the police) fear the worst when she doesn't turn up right away. So far, it's a tense and engaging story that I am loving. On audio, I finished listening to Disappeared by Francisco X. Stork. I am a huge fan of Stork and enjoyed this novel. It's set in Juarez, Mexico, about a young woman whose best friend disappeared one day, along with many other young women over the years from their city. As a reporter, she is looking into the disappearances, but powerful people want to stop her. The narrative goes back and forth between her and her younger brother. It was intense and suspenseful, with in-depth characters, and an examination of some important issues, like all of Stork's novels. I have now switched my listening to a darker vibe now, too (though again, my last audio book would definitely have fit for RIP) and started Dark Saturday by Nicci French. When I chose this one for review, I didn't realize it was part of a series (the Frieda Klein series), but there were some hints at the beginning to catch me up. The titular psychologist is asked to look into an old murder case, where a girl (now a woman) was convicted of killing her parents and has been in a mental institute ever since. It's good so far - dark and gripping. My husband, Ken, is reading Waking Gods, book 2 of The Themis Files by Sylvain Neuvel. He and I both loved book 1, Sleeping Giants, and I realized earlier this year we'd missed the release of the next two books, so I gave him this one for Father's Day (I'm next!). It's a suspenseful and thought-provoking trilogy about a giant hand found buried that is definitely not human-made. I can't wait to get back to this fabulous series! Our son, Jamie, 23, finished book 11 of the Wheel of Time series by Robert Jordan, Knife of Dreams and moved right along to book 12, The Gathering Storm, which is the first one that was co-authored by Brandon Sanderson. Today's the last day for the Big Book Summer Challenge! If you are participating, be sure to leave links to your Big Book reviews or challenge updates/wrap-ups on the Challenge page or leave your updates in the Goodreads group (you have another month to finish up reviews and/or wrap-ups). Seems like it's been an excellent Big Book Summer for a lot of people! I'll be posting my own last review and wrap-up this week. We're having a quiet weekend too -- and it's too hot to do much outside. You all are reading some good books in your house. Yeah, a good time to hibernate and read! I love books that keep me up reading late into the night (even if I don't feel so great about it the morning after - lol). City of Savages sounds like my kind of read!! I'm sad that the big book summer challenge has come to an end, but how wonderful that there's always next summer! Have a wonderful reading week, Sue! So glad you enjoyed the challenge and joined the fun! Happy Labor Day! I just started The Stars Beneath Our Feet, one of the ALA award winners. Wow! Lots of interesting books here. I really need to get back to reading more YA. I've never read Stork or heard of City of Savages. Come see my week here. Happy reading! Kathy - I think Stork's best-known novel was probably his first, Marcelo in the Real World, one of the very first YA novels narrated by a young person with Asperger's. Hope you are enjoying your books, too! I'm interested in Disappeared, a new title to me, Sue. I hope you get a cooldown soon! We are cooler finally, but the heat is coming back. September has its ups & downs! Happy Reading today! Me, too, Linda - another scorcher here today! I just want to be able to get outside and walk again comfortably. Hope you are enjoying your books this week, Lisa! I do hope that weather cools, humidity is the worst. Must feel good to have that drawer cleaned. When I do something like that, for awhile every time I pass I admire with satisfaction! ha ha - yes, I have been doing that, Kathryn! Even better, I tackled the doorway area of our home office, which is a dumping spot since it's near the door we use. I keep just walking by there to admire the sweep of empty floor space! Me, too, Colletta! Hope you are enjoying your books. It has been a hot summer. At least our Colorado nights have been cooling things off a bit lately. I’m not starting my creepy books until Oct. Just 50 more pages of my 3rd big book to finish this afternoon. Thanks for hosting this challenge—I hope to have two more reviews up shortly. Ah, cool nights sound lovely - it's still been high 70's and very humid at night here. I used to only read the creepy stuff in Oct but the RIP Challenge covers Sept & Oct...and I really enjoy it! Congrats on the Big Books! I look forward to your review! My weekend was routine and quite a lot of reading done. Reviews piling up because my pc on the blink. Hope you get it fixed and are back in business soon! Nice that you were able to read a lot this weekend. FIVE big books! Sue, you astound me. ;) Very nice work, my friend. ha ha thanks, Ricki! Not really work ;) lol Actually, it's 6 books total, since I found out one of my audios was over 400 pages! Francisco X. Stork was one of the contributing authors in the book I just finished. All the authors shared their own stories with mental illness. Oh, wow - that sounds interesting, Anne. His novel A Memory of Light was really good - about depression and suicide in teens, something my cousin has dealt with so especially powerful for me (and I shared the book with her).